Manchester Center, VT - November 29, 2012 – In 2009, Digital Wish launched the School Modernization Initiative, a one-computer-per-child initiative in 28 schools. The A. D. Henderson Foundation commissioned Digital Wish to study how schools are sustaining their technology initiatives. The research was expanded with a nationwide survey and 27 administrative leaders were interviewed. The most successful schools develop multiple sources of revenue, they trigger strong community engagement, and they prioritize daily support and training for teachers. Nearly half (46%) have not used other budget line items for technology. 55% of respondents’ schools have not applied for any grants. 43% reported they do not do any fundraising. 66% do not use student mentors who could support the technology program. Over 1/3 say they do not receive donations from outside organizations. Data from the Interviews: Digital Wish identified 27 technology leaders from across the nation and conducted interviews to ask how they were sustaining their initiatives. As a trend, nearly all of the most sustainable programs were funded by multiple sources. Administrators running programs with just a single source of funding voiced “fear” that their initiatives were vulnerable to cancellation. The most successful schools intentionally develop strong community ties, which in turn generates multiple sources of revenue, thus lowering the risk that their technology initiative will lose funding with market shifts. Only 14% of schools report “re-budgeting” as a major source of technology funding, however interviewees report it’s the most viable and immediately available strategy. Although half of the survey respondents are not applying for grants, the interviewees shared that this is one of their most effective sources of funding. Over a quarter of schools who apply are raising over $20,000 per year. 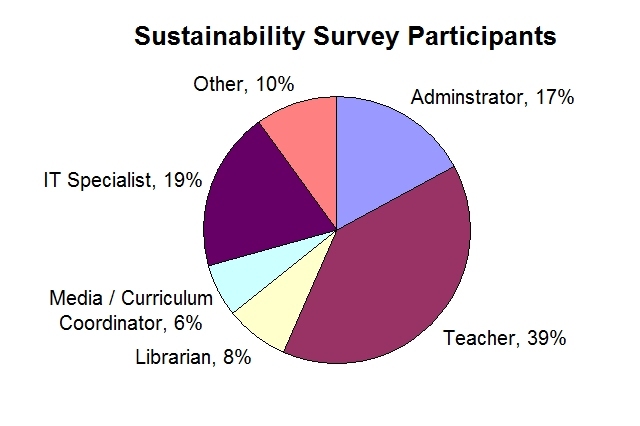 Most schools do not make an immediate connection between raising community engagement and sustainability. By simply raising awareness, we open up immediate community support networks for many schools. Fundraising is frequently viewed as “something the PTA does.” However, successful schools integrate fundraising into every school event. One in five schools who fundraised actually raised over $20,000 each year. Schools inexperienced with adopting technology emphasize hardware purchases, while the more advanced schools focus on the importance of training for sustainability. Nearly all had supplemented convention workshop-based professional development with teacher peer-support systems and daily mentor programs. The most successful schools integrate a peer-coaching model that provides ongoing and readily available support for their teachers on a daily basis. Student mentorship programs typically reduce support costs and increase availability of support for both students and teachers. Data from the Classroom: The implementation of 1:1 computing in 28 schools revealed that the key to developing multiple funding streams lies in strong community engagement, which is also typically the most ignored strand in every initiative. The schools with the most sustainable programs harvested a wide array of revenue opportunities from across their communities – each contributing a portion of their total financial need. However, the burden of community engagement rests entirely on the schools. If the schools don’t trigger these community connections, they simply won’t materialize. For more information on the study, please contact: Heather Chirtea, [email protected].